Last edited by Phoenixsong; 09-07-2018, 03:52 AM. Just a heads up, I already encountered a Mythic Asha'Bellanar after only 12 minutes of the event. Not sure how anyone was able to get her so quickly. There’s lots, she was top prize in the PvP couple days back. Good to see them beatable. Was she? That makes me feel a little bit better then. I was thinking this was the first event she was available as a reward. Thanks for letting me know I was mistaken. -What are u doing when you see Asha? Last edited by Heal and Harm |VK|; 09-07-2018, 04:29 AM. so basically the shapeshifters are still not reachable for people outside the top ten guilds. why are they essentially behind a pay wall? ? There have been multiple flash packs for Shapeshifter Morrigan at this point, and the Raid Portal Keys are available directly on the ladder, so that you can have a chance at the Shapeshifters Raid. What is the banner curve for this event? 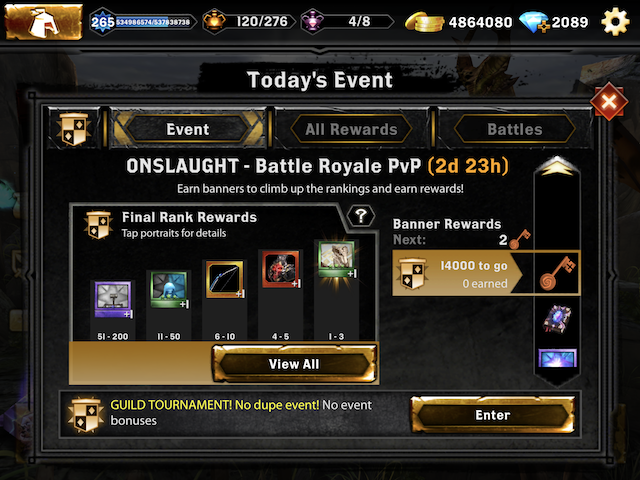 It seems that it's the normal curve (5 banners/fight @ around 13k banners) which means 1385 fights (~700 gems) to get to the top of the ladder. If so, i don't think the keys are worth the effort. Should be approximately 634 gems to get to the banner stretch assuming you just grind from 0 to 14k without a loss. The more natural refills you do the less gems. The more losses you take the more gems. Definitely a grind but each person will have different opinions on whether or not it is worth it. tayna the shapeshifter raid is meant to be somewhat exclusive for now, it that doesn't mean it will always be that way. I, like you, do not have the time to put up 14k banners in this event so I am missing out on this run. I'm sure we will get other chances in the future hat will be more appealing. I'll just say this is one of the best gw ever, we have T8 and Los so competitive, nice to see them, hope they will keep it up for neat gw. On the other hand this is the worst gw ever also, we have so many bugs, so I never knew what the outcome will be from a fight. I could lose to a enemy without ant runes then win. Atter that same team same setup me without rune I lose, before the same fight I lost with runes. This is the second or third event this last couple of weeks that i encountered that idiot error "timed out" so often that im seriously thinking of quiting the game. I just lost the orange keys and 600+ gems because of that error that prevented me to get 100 more banners to reach the 14k mark. I feel cheated. I slept 3hrs a day and spent all those gems so i can get to 14k just to be stopped repeatedly by a bug...or a server error...u name it. I am really really disappointed about this outcome. I really understand your frustration and I support you, I lost Garahel this summer competing at top 50 because of the connection issues and it is very annoying. I hope all the connection problems will be fixed soon, it is really frustrating playing in that way.